is a modern interpretation of an ancient Japanese Zen doll known as a Daruma doll. This curiously limbless, traditionally red-cloaked figure with unpainted eyes is used for personal dedication to a new venture such as starting a business, beginning a new path in life, or given as a gift for celebrations like New Years, weddings and birthdays. Painting in DCTO’s left eye shows commitment to a goal; once the goal is achieved, you then paint in DCTO’s right eye. DCTO (‘dik-toe’) is designed to right itself when it is knocked over, reflecting the Japanese saying, ‘Nanakorobi yaoki’, ""Fall 7 times, rise 8 times”. This reminds us that no matter the number of times we may stumble, those with a persistent heart will rise again to achieve their goals, symbolizing relentless dedication and an undaunted spirit. The Japanese American National Museum in association with Dacosta of Chocolate Soop bring you the first custom vinyl toy show in a museum. Just in time for the holidays, 40-50 artists will customize Chocolate Soop DCTO (Dream Come True Object), a futuristic vinyl version of a traditional Japanese New Years folk toy. 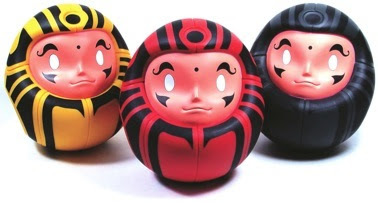 View all the Daruma Dolls HERE !